Using any type of earth internally, even well known therapeutic healing clays, is quite a daunting proposition for those unfamiliar with the nature of specialty clays. However, there is no doubt that the informed use of clays internally, coupled with dietary modifications, can accomplish healing and system support to a degree that no other substance can. Furthermore, activities such as drinking clay water, sucking on dry clay balls, and using clay for dental health, is a practice that predates recorded history and spans the entire globe. Evidence strongly suggests that people (and animals) have been safely and effectively using dietary clays for health since before the advent of fire. There are clays available that are perfectly safe to use every single day, there are effective clays that probably should only be used in moderation (but are very therapeutic); some clays that may pose a risk to use ( but have been proven to be very effective for some illnesses ) and then there are clays that should not be taken internally. There are some clays that are likely very good, but do not have an extensive history of human use. So, choosing a clay that is right for any one person can be quite intimidating. Through the rest of this article we will attempt to demystify edible clays. Geophagy is the act of eating dirt, soil, clay or chalk, and is often associated with the medical condition known as Pica. Pica is an eating disorder whereby an individual experiences an actual physical craving to eat earth substances. Pica can become a dangerous condition, as individuals often consume substances that may contain dangerous contaminants. In modern times, individuals with Pica have been known to consume dry paint, and other industrial substances that can quickly become dangerous to the health. Pica should not be confused with Pelotherapy. In fact, Pica can sometimes be successfully treated with Pelotherapy. Fine quality clays, ideally selected from all over the world, are combined and completely hydrated with quality water, and the individual suffering from the malady consumes the clay colloid rather than other earth substances. Pica is thus successfully controlled as long the individual consumes this healthy product, and Pica is cured when an individual no longer experiences a physical craving. It should be noted that no individual becomes addicted to ingesting, eating, or drinking healing clays, who has not already been suffering from Pica. No individual who begins pelotherapy becomes addicted to these substances. In fact, there are individuals who, due to unrectified health conditions, have had to learn to rely on drinking clays in order to maintain a good standard of health. Mahatma Gandhi was one such individual. Others, such as Jordan S. Rubin ( founder of the "Maker's Diet ), have been able to regain a full life, in part, through the practice of using clays to help with life threatening digestive conditions and disorders. Even more people, such as many of the sufferers of the Dunsmuir Chemical Spill, discover that dietary clays can be literal life savers in an emergency situtaion. In Dunsmuir, the medical community at large was not able to respond at all to the extreme levels of toxicity experienced by the folks in Dunsmuir. The university scientists came and went with hardly a word for the wary ( or the wise ). Clay use provided rapid and permanent relief from severe symptoms of accute toxicity that showed strong indications of becoming chronic. Bentonite and other healing clays are not to be taken internally concurrently with life-sustaining prescribed medications without very careful medical supervision. Bentonite and other healing clays used internally in conjunction with medications or herbal programs may lessen the effects of medications without careful administration. Bentonite and other healing clays should not be used internally with those who currently have high blood pressure, without proper supervision and other supportive treatment. Bentonite and other healing clays should not be used by those with a clinically diagnosed iron intolerance ( a rare condition ) without seeing a laboratory analysis of the clay used or blood sample monitoring. Many cultures have used natural clays in small amounts as a part of a daily diet (see the work of Dr. West Price DDS, Nutrition and Physical Degeneration, Price-Pottenger Nutrition Foundation). Traditionally, many indigenous tribes utilized clayish water to prevent upset stomachs by dipping their food in clay solutions while eating. Furthermore, in some rather unique parts of the world, clay particles naturally deposited in the entire local water supply (such as the area where the Hunzakuts live, in Pakistan) have been consumed daily for a lifetime. People who live lifetimes in similiar locations are traditionally extremely long lived and healthy, with the clay particles being one factor of high quality water supplies that contribute to healthy living. When introducing clay into the diet of an adult, there will be an adjustment period where a wide variety of brief side effects may manifest. As an example, constipation may occur. Clay taken internally does not cause constipation, the overall condition of the body's elimination system is the determining factor. It is not wise to stop clay use totally if constipation occurs, as this should indicate to the individual that serious degenerative conditions are present in the digestive system. Different healing clays will respond differently with different people. Every therapeutic clay and every person is unique. One person may love the clay that the next person dislikes, and vice versa. Healing clay will seldom respond in synergy with unhealthy foods and an incorrect diet. For maximum benefit, both the liver and the elimination system needs to be properly stimulated. When utilizing clays internally, it is equally important that the body is properly hydrated. The quality of water is an important and equally unstudied element in preparing healing clays for internal use. In a modern society, it is increasingly difficult to live a lifestyle that promotes true health. While understanding how to best utilize healing clays internally is important, we'd also like to clarify that benefit can be achieved without modifications to diet and lifestyle. 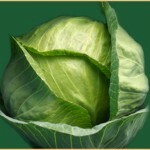 However, for sustained health and maximum effect of clay, dietary considerations are extremely important. One tablespoonful of dry clay is added and mixed with about eight ounces of quality water. The clay water should be taken on an empty stomach, preferably in the morning and/or late in the evening. Please keep in mind that clay should never come in contact with metal. Repeat this process for three days. After the third day, abstain from clay use for four days. Then, resume use for four days, and pause for the following three days. This method of use can be continued throughout the adjustment period ( or even the complete period of use ). The period of time it takes the body to adjust to oral clay use is certainly variable. However, generally the body will be acclimated to use within two to four weeks. Once the body adjusts to clay use, there are many different strategies that can be used, depending on the need. Side effects such as constipation are byproducts of a digestive system that is functioning far below ideal levels. Healing clays in themselves do not cause digestive or elimination problems, as we've demonstrated on more than one occasion with relatively high amounts of clay water (1 - 2 liters daily) taken for upwards to six months (experimental treatments), with no need for any additional fiber or laxatives. Elimination problems are symptomatic, and it may take a minimum of six months to a year with proper diet and clay use, to correct imbalances. However, many users will find that a quality psyllium tusk / water mixture will assist alleviating any difficulties experienced during treatment. The best method remains following the sage guidance from Raymond Dextreit as outlined in his book Earth Cures. Truly, there are no shortcuts to a healthy digestive system, and a modified macrobiotic diet devised in accordance to the many principles of natural medicine is the only certain way to completely normalize digestive functions. Stimulating the body's elimination system is an important part of all aspects of pelotherapy. We cannot stress enough the importance of utilizing therapeutic clay baths in conjunction with healing clays used internally, and vice a versa. While this may be impractical for some, we highly encourage those who are able to acquire larger amounts of clay to do so -- even if the clays utilized for baths are only technical grade clays. Once the body is adjusted to healing clay use internally, it can be advantageous to change tactics: Rather than continue utilizing a clayish water, begin ingesting a teaspoon to a tablespoon of clay "gel" or "magma" directly. When the body is adjusted to internal use, there will be no noticeable strange or uncomfortable effects associated with using clay internally. Bowel functions return to normal, the profuse fragrance associated with detoxification via healing clay will be gone (bowel movements), and the sometimes "unexplainable" side effects, such as fluctuating blood pressure, unique physical sensations in the abdominal region, changes in urine color, etc., will have disappeared. It is important to remember that "clay water" and a properly hydrated clay gel or magma are truly two different substances when considering how the clay responds to any environment. Clay particles, when separated by water, lose their "collective" effect. The "unexplainable" electromagnetic effect of the clay which can reach deep into the body, becomes non-existant. There is no combined charge associated with the separated particles, and the charge layers are vastly reduced or even nonexistent. This is also why a clay bath is NOT comparable to clay packs / poultices used on the body. 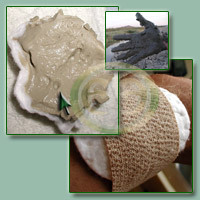 At this point, due to the difficulty in actually studying the actual health benefits of using healing clays internally (rather than simply measuring quantifiable variables via lab testing), the best we can say is the difference between ingesting a clay magma and clayish water is significant, and most users who are able to listen to their bodies carefully will notice an immediate difference upon ingestion. How long any user should continue utilizing bentonite, illite, or montmorillonite (to list the most prominent healing clays) internally must be left up to each user. We view using edible clay as a natural, healthy dietary habit. We know people who have ingested healing clays daily for over 20 years with nothing but beneficial results, but we can hardly advise anyone to do so. One's health must be one's own responsibility. Dietary considerations should be addressed (does an individual eat properly? ), and the body's natural cycles should be carefully considered as well (the body has a natural 72 hour cycle, a 24 hour cycle, a 12 hour cycle, an eight hour cycle, a six hour cycle, and a four hour cycle, to name a few in accordance with natural medicine philosophy). For those who experience too much constipation from ingesting healing clays, and who also do not tolerate psyllium, another alternative is to add hydrated clay to a slurry made from activated charcoal, and also combining internal clay with Diatomaecous Earth. Consider adding magnesium bicarbonate to all water consumed. It is very easy to make, and very healthful. There are so many people selling and using clay, offering an enormous amount of fallacious advice. This is usually done out of ignorance and not maliciousness. In this section of our article, the author's intent is to present the most researched opinion in the world to date. I do not wish this advice to replace what the reader may have found by dealing directly with other individuals actively and ethically researching healing clays. Rather, I would desire that you augment it. While I am going to state what we have discovered throughout the years in no uncertain terms, I do not wish this to seem like we are attacking any company or apposing viewpoint. There is a great confusion in the world at large about what makes bentonite bentonite, what makes montmorillonite montmorillonite, and what makes caclium bentonite a calcium bentonite and not a sodium bentonite... What is a volclay, and what makes a volclay different from a sea clay or a glacial clay? Ad infinitum. What makes a bentonite a bentonite, and what makes a montmorillonite a montmorillonite, is simply the name people call it! Whether someone calls it by the French name or the American English name, what they are stating is that the clay is a smectite with certain particle characteristics. Smectite layers are stacked on top of each other, and the particle shape is rectangular; when hydrated, the colloid presents a zeta potential with a negative charge. Minedat.org has it correct when they list montmorillonite as a synonym for smectite, and list bentonite as a clay consisting primarily of bentonite. Therefore, when considering therapeutic clays, do not get caught up in terminology. First off, what you need to know is this: Is the clay volcanic or sedimentary? Sedimentary clays are usually very impure, found in seas and some glaciers. Sedimentary clays are the result of devolution. For those who have esoteric interests, this is a big difference. Volcanic origin clays are at the beginning of the evolutionary process, and sedimentary clays are at the end of this process. Sedimentary clays may be dangerous to use due to unknown contaminants and or a high level of substances such as lead, arsenic, cadmium, etc. Are some sedimentary clays recommended as edible clays? YES, they are. Is there good reason for this? Yes, there is. However, you need to be educated about the potential risks associated with these clays. There are also substances such as pyrophylites used that feel nearly radioactive to the touch, which have been used for healing. One such clay proved VERY effective at treating very late stage AIDS patients in Mexico. Even so, one must carefully question the internal use of such clays, day after day, week after week, year after year. One individual might say: "I have taken three clay capsules a day for ten years and feel fine". But, in reality, neurological effects may not begin to manifest as health issues for twenty years. There is always an undeniable uncertainty factor in using clays internally that are not clean. Therefore, such clays, in our opinion, need to be used quite differently (with care) than other clays. The extremely pure calcium smectites and the sodium smectites prevelant for use as edible clays in the United States are evolutionary clays (volcanic origin, and very, very "clean"). One could (and the author has) drink as much clay water as the body can handle, and experience only benefits long term. One can safely use these clays for a lifetime. What we know about calcium bentonite and sodium bentonites is that they are almost always inert in the body. As such, they cannot directly cause any harm in the body. These are the only two classifications of clay that we know to be inert in the body: Clean calcium Bentonites and clean Sodium Bentonites. Illites, pyrophylies, and other clays appear to be active in the body, and not inert. In some cases, we suspect that some of the clays being used actually irridiate the body. There may be times when such clays are the perfect clays to use. One of my favorite clays to blend into my internal clay formulations is Green French Illite. However, I do not use it in bulk. I use it on occasion, and only a very, very small amount. If I feel I have consumed something that is making me sick, I do not reach for illite, I use calcium bentonite and sodium bentonite. There are some articles that state that sodium bentonite should not be used internally. Some articles state that it swells too much. Others state that it gets stuck in the intestines. Both of these statements are proposterous. One individual emailed me and told me that his intestines were caked with sodium bentonite. I asked him how he knew. He said that Aajonus Vonderplanitz looked at his Iris ( Iridology ) and told him. I thought how impossibly interesting; would you be willing to get a colonoscopy? Of course no individual who has ever claimed that clay is stuck "in the gut" wanted this illusion shattered by actually finding out the truth. In fact, the very first clay supplement developed in the U.S. ( and it is still widely used today ) is a prehydrated sodium bentonite developed by V. Earl Irons for use in colon cleansing. As Earl knew, an ultra-pure sodium bentonite is the perfect choice for lower digestive system failure, because not only does a good sodium bentonite have excellent sorption properties, but it also has superior absorption properties. That's why it swells so much. This means that it can actually evecuate material more effectively from the digestive tract. People who perport to be very, very chemically sensitive most often are drawn to either the richly green sodium bentonites or the pale green calcium bentonites for internal use. The bottom line is that if you are working with someone experienced with using healing clays internally, and you trust their integrity, relying on their personal experience may prove to be the wisest choice; smply augment their knowledge with anything you've learned here. For example, there are clearly lethal conditions such as AIDS, cancers, and systemic infections that a particular clay may work well with, even if it is sedimentary and contains an abundance of potentially undesireable elements. Our favorite internal clay is the green desert calcium bentonite originally found in the California Mojave desert, fairly near the Nevada border, in the Death Valley Region. This clay shares the swelling characteristics of sodium bentonite, as well as provides the added benefits many believe are associated with the calcium smectites. As a bonus, this clay is actually one of the clays that tested antimicrobial from the Arizona State University Study. This is a clean smectite, and thus is one of the inert clays that can be used in the body under the original GRAS FDA clearance ( while all pure clays fall under this classification, the FDA's original intention is for the clean, "evolutionary" volcanic origin clays, because these are what were used as medicine PRE-FDA, which is the whole point of the GRAS classification -- some companies, as an example, market other clays that were not used pre-FDA, such as certain Zeolites ). This clay is available by bulk purchase here in the United States: Green Calcium Bentonite ; also available is a line of supreme clay blends for internal and external use. This clay is also available in Australia via Echolife: Calcium Bentonite in Australia. My next favorite clay for internal cleansing is the richly green sodium bentonite from Wyoming. Interested individuals have to check with local supply companies to try to find a local source, or contact American Colloid Company Direct for bulk purchasing. Again, this is a very clean volcanic origin smectite clay. We recommend using the HPM-20, due to the purity and minute particle sizing. Next, there several other calcium bentonites that are great to try. Pascalite from Wyoming has a great history of use; a safe and effective internal use clay. Redmond Clay is a fanastic clay supplement, a richer sodium bentonite than the Wyoming sodium bentonite. 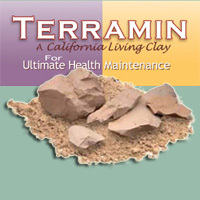 Last but not least, we recommend Terramin - Red Desert "Mineral" Clay, famous for the incredible scientific research conducted by NASA. And YES, we are very glad to report that we have verified that it is true that daily supplementation with calcium bentonite in fact CAN REVERSE osteoporosis, at least under the right conditions. Now, again, we do recommend individuals try some of the following clays as secondary clays. By secondary, we mean that we cannot know absolutely what effect it has in the body, but we know absolutely that under the right conditions, these clays are extremely therapeutic. Green Illite by Argiletz. This is probably the most used and safest (concerning internal use) of the non-smectite therapeutic healing clays. Sacred Clay aka Pyroclay (sold by Michael King) is an amazing mineral, and those individuals who are metaphysically and esoterically inclined will know doubt enjoy experimenting with his mineral rich clays. Lastly, I'd like to say a few words about Zeolite. Zeolite is an amazing mineral, and has quite a few characteristics that make it an ideal therapeutic mineral. However, like most of the secondary clays above, zeolite is not likely to be inert in the body, and I believe this mineral must be handled more very carefully prior to use in the human body. Considering how much we know about traditional-use clays, I have long hesistated to suggest that people try zeolites. However, we have been using and studying a very high quality micronized zeolite, and based upon all of the Eurpoean studies done, we do believe that micronized zeolite, properly produced, does have great value as an alternative medicine. We don't say "natural medicine" because we haven't found evidence of humans or animals chomping on rocks! In its natural form, zeolite is a rock, and via micronization becomes a "clay". If both quality and affordability are an issue, a high quality, bulk micronized zeolite powder may be purchased so that one can make one's own hydrated "liquid" zeolite. Is Redmond Clay or any other bentonite clay safe to use internal and external because I found out that there is a lead in clay? Can you get lead poisoning from bentonite clay ? Traditional use healing clays (those that have been used by humans and animals for hundreds of years) have been shown to be very safe to use internally and externally. Many of us clay enthusiasts with a life long exposure to healings clays have also done extensive heavy metal testing to demonstrate that our bodies contain low levels of heavy metals, as well. Remember: Clays BIND heavy metals, it is one of the things that makes a good clay useful. Thanks a lot for all this information. I have been using Sodium Bentonite Clay from Australian Healing for 1 year now. Do you know if that brand is safe? Otherwise I will use Echolife if that's a better brand. I also have a question about the amounts. Since Donna Pessin suggested through her book and video's to take at least 8 tbs a day. That didn't work for me so I had to go to 4 tbs. I mix the clay with water and rice milk. What do you think of the amounts? Is it too much or not enough? The sodium bentonite and the clay that Echolife carries are two completely different clays. I would pick some up from Echolife and try it so that you can see the difference for yourself. Very, very, very rarely would I recommend someone take 4.... let alone 8... tablespoonfuls of clay a day. Using clay as a hammer seldom works. Only in cases of acute poisoning and severe bacterial imbalance in the digestive tract... do I recommend larger amounts of clay. And when this is indicated, relief and results are achieved VERY quickly. For general uses, even in chronic illness, the maximum dosage of clay for regular use should be considered one tablespoonful doses three times daily. Donna Pessin had made some VERY incorrect assumptions. If you start with an incorrect assumption, then your conclusions going forward will all be wrong. At this point, I'm personally not comfortable with ingesting the black mica clay. There is quite a bit of hype about this type of product, but it is very different in mineral composition, including co-minerals found in black mica, than any traditional-use clay we've ever studied. Having reviewed website details that purport to "put to rest" concerns about using such a product... I see every test published BUT the tests I would personally conduct. I would need to do much more research to satisfy myself, which I am not willing to do at this time (we would never get involved with any such hyped-up products). 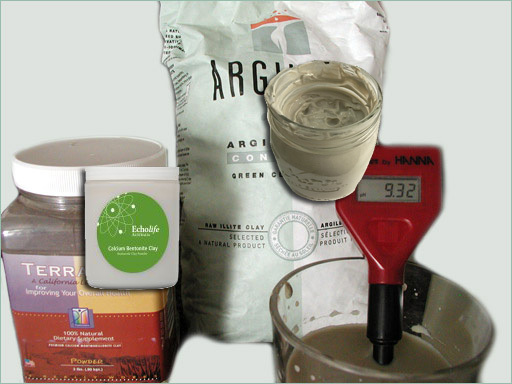 Your website on healing clay mentions safety of edible clay calcium bentonite from WY Big Horn Mountain. Years ago label said for internal use. Current label does not say so. I have used it externally on different parts of body one-time. This Oct.I used clay on right cheek which had darker brown color as a result of using ASEA Renu 28 skin gel & stopping. So process was not completed. I thought using a more natural clay was better. I searched online on its use which said weekly or 3x/week. Due to my schedule, I used it 3 days in a row & some layer got removed. But my facial skin is so delicate that some layers got peeled off. I stopped using clay & used freshly cut aloe vera gel which formed darker brown layer to protect it. However, skin was so dry & itchy. I applied organic coconut oil to soften. I had to stop aloe as brown layer would repeat after older layer peeled off. I applied colloidal silver water gel until now.Emu oil was sometimes used when very dry.Still treating now. I was reading the contraindications and didn't see anything about taking precautions for individuals with mercury fillings. Isn't there a possibility that once the clay is being consumed that it is likely to come in contact with the filling thereby etch and release the mercury when swallowing the product? If so, would it just remain attached to the clay while being digested and finally excreted? There is no contraindication to taking clay internally with mercury amalgams present. It probably isn't a good idea to prolong contact with clay in-mouth and then consume it, but drinking clay water will not result in mercury leaching into the body, any more than it already does. That said, a very good practice for those with metal in-mouth would be to obtain some NAC powder, add a small amount to water, and-- in essence-- rinse the mouth out with NAC. The NAC will "pick up" any freely available mercury in the mouth, and prevent it for being absorbed into the body. Of course, always spit out the NAC!